Note: Fly safely and responsibly, folks. Never flown before? Learn to fly for free over here. Need to get your FAA commercial drone certificate? Start studying over here. Drone aerial photography is, wait for it, taking off. Whether you’re using them for recreation, to build an aerial service business, or to integrate UAS into your existing business or organization, the goal of this article is to explore the best RC drones with a camera on the market today. Yes, a list of the best camera drones is quite arbitrary. There are many, many companies and models that are not being represented in this article. We know that. But we also have a good feel for the big prosumer / commercial drone manufacturers, we’ve flown most of these models ourselves, and we’re doing our best to curate and to highlight the most popular models in this list. Click here for a much bigger list of drone companies to check out in the industry. The DJI Mavic 2 Pro is the latest and greatest camera drone from DJI, with a professional-grade camera from Swedish camera manufacturer, Hasselblad. The 1-inch CMOS sensor Hasselblad camera offers 20 megapixel photography with enhanced HDR and color sensitivity. A new feature debut to come along with the DJI Mavic 2 Pro is omnidirectional obstacle sensing—it can sense obstacles from five directions (forward, backward, downward, left, right). Plus, it’s equipped with upgraded versions of Active Track, Waypoint, and Point of Interest modes, so professional photographers and videographers never have to place a cap on their creativity. The fly more combo has been unbundled from the base model and is now the fly more kit. This kit is packed with all you need to get the most flight time out of your Mavic 2 Pro. Use these links to purchase select Mavic 2 Pro accessories separately. The Mavic 2 Pro is great for professional photographers, videographers, and content creators. It’s portable design makes it an essential companion for travel bloggers, documentary compilers, and commercial drone pilots in any industry. The Mavic 2 Zoom introduces brand new zooming capabilities. The 24mm – 48mm zoom lens offers 2x optical zoom and 2x digital zoom, giving photographers and filmmakers more flexibility when it comes to framing their shots. It also offers an upgraded QuickShot mode with the fun and creative Dronie, Circle, Helix, Rocket, Boomerang, and Asteroid and Dolly Zoom flight modes. The Mavic 2 Zoom will make a worthy addition to your cinematography, videography, or photography tool kit. The impressive 2x zoom lens will add a new angle to your videography, and the QuickShot modes are fun to get creative with. The DJI Mavic Pro is a game-changer for aerial photographers and filmmakers. Originally marketed as a professional (and portable) aerial media system, it’s small size actually hides a pretty high degree of complexity and sophistication, and it’s priced in a range that makes it available for the novice aerial cinematographer. The latest update to the Mavic Pro is the Mavic Pro Platinum, which flies much more quietly than the Pro, and for much longer. The Mavic Pro Platinum is 60% quieter than the Mavic Pro, and has 11% more battery life, bumping its average flight time up from 27 minutes to 30 minutes. Based on discussions with our community members and initial market reactions in Facebook groups, forums, and YouTube videos, I think this will be one of DJI’s (and the greater drone industry’s) most popular models within the next 3-6 months. The DJI Mavic also boasts obstacle avoidance, sensor redundancy, and runs vision positioning paired with GPS and GLONASS to ensure precise positioning during both indoor AND outdoor flights. The DJI Mavic is great for traveling, for a serious hobbyists, or for someone just getting into the commercial side of the industry. With DJI, you’re getting access to a huge ecosystem of commercial activity, apps, accessories, and more. DJI’s Mavic Air is the hottest new drone on the market, and combines the best features of the Mavic Pro and the Spark. The Mavic Air is super small, like the Spark, and it can fold up to become even smaller, like the Mavic. It can be flown with gesture control, like the Spark, but it also comes with high quality 4K video, like the Mavic. In short, it’s a drone that’s really easy to fly but also provides high quality stills and video. ActiveTrack can sense up to 16 subjects simultaneously, letting you choose the right tracking subject. It comes with higher tracking precision, so you can follow targets even when they’re running, jumping, or cycling, or moving somewhat erratically (for instance, riding a bicycle down a mountain). QuickShots has six different options: Rocket, Dronie, Circle, Helix, Asteroid, and Boomerang, and can be shared to social media via the DJI GO 4 app. SmartCapture lets you control the Mavic Air by hand, making it convenient for drone newbies or professionals working with multiple systems. Similar to the Spark, you can launch, fly, and take videos or photos on the Mavic Air using only hand gestures. TapFly lets you fly wherever you tap on your mobile device screen, and works in Forward, Backward, Free, and Coordinate modes, letting you adjust flight speed to suit your aerial needs. Ever heard of dual-operator mode? The DJI Inspire 1 lets one person fly, and another person control the camera. I’ll tell you this. Once you fly dual-operator mode, it’s hard to go back to flying solo. Operating sUAS with a talented crew member is really fun. The DJI Phantom 4 is one of the top drones on the market right now. It’s the fastest Phantom so far, capable of reaching top speeds of 45 miles per hour. It also gets an excellent flight time of 28 minutes — great for pro pilots to get the shots they need and minimize downtime. The Phantom 4 also has a built-in camera that can record video at 4K, 2.7K, 1080p and 720p. But one of it’s most notable features is the obstacle avoidance system. The drone can intelligently position and maneuver itself around obstacles mid-flight. Couple all of this with a Tap to Fly system, DJI’s reliability, and robust software, and you’ve got a tough drone to beat. DJI recently released the Phantom 4 Pro Obsidian, which comes with a magnesium shell and anti-fingerprint coating, not to mention the super cool-looking matte-grey obsidian coloring. You can buy the Phantom 4 Pro Obsidian now on the DJI website. Improvements to the Vision Positioning System (VPS) and front-mounted obstacle sensors help provide greater security and confidence when flying indoors or with lots of obstacles around. DJI recently released the ZenMuse X7 camera, a Super 35mm camera created for aerial cinematography, which is compatible with the Inspire 2. Learn more on the DJI website, or by watching the video below. The model’s new image processing system, CineCore 2.0, can capture 5.2K video at a whopping 4.2Gbps bitrate. To handle all that data, the Inspire 2 has added an onboard SSD. You can buy the DJI Inspire 2 with the new Zenmuse X4S or X5S camera. The X5S boasts a micro 4/3 sensor and supports 10 different lenses, including zooms. For aerial photographers, there is a DNG RAW mode that captures 30-megapixel still images. DJI is a drone manufacturing juggernaut. Their DJI Phantom 3 series arguably represents the best selling drone models of 2015 and 2016, and one of the best drones with a camera. Within the series, there are four different models: Standard, 4K, Advanced and Professional. The DJI Phantom 3 Professional is the most sophisticated option in the series, and as the name suggests, was designed for professional pilots. It offers 4K video, 23 minutes of flight time, and a whopping 5km control distance. These autonomous modes free you up to focus on camera control and getting the right shot. This makes the DJI Phantom 3 Professional a smart choice for pro pilots. If you’re on a budget and/or able to sacrifice some of the bells and whistles of the newer systems, the Phantom 3 series offers more affordable pricing but units that still pack a lot of punch. Mantis Q is an adventure-ready drone that features voice control technology and is small enough to tuck away inside a bag. The Mantis Q also features foldable arms for optimal portability and convenience, up to 33 minutes of battery life and autonomous flight modes with top speeds over 44 miles per hour. Due to its portability, ease-of-use, and superior flight time, the Mantis Q is ideal for professionals, adventurers, families, and drone enthusiasts. The voice control feature will most set this drone apart, but that’s not all Yuneec wanted the Mantis Q to be capable of. In order to compete in an increasingly competitive market, Yuneec equipped Mantis Q with all the bells and whistles. The affordability of this drone is also an attractive feature, retailing at less than $500, which is about half the price of similar drones from other leading drone manufacturers. With those savings, you may want to add on the Mantis Q Propeller Pack as well to keep your drone flying efficiently for longer. The H520 is equipped with six rotors, a 360-degree gimbal camera and retractable landing gear with Yuneec’s standard of being ready out of the box, easy and safe to fly, with stunning Ultra HD 4K video and stills. The H520 was built for both industrial use and ambitious professionals. It comes with a long focal-length lenses that allows the drone to fly at a greater distance from an object and data storage that may be shared instantly from the ST16S Ground Station or delivered directly in 4K/2K/HD video or 20Mp still images. The U49C Red Heron quadcopter looks sleek and is a great camera drone for the beginner drone pilot. Force1 RC includes an extra battery in this model, which doubles your flight time and is great for folks logging those first few hours of flight. The Red Heron also comes with spare motors, which is a great value add, especially for beginner drone pilots. The Spark comes with DJI’s new QuickShot mode, which automatically creates a 10-second video from the footage captured in your flight. QuickShot allows you to avoid all the work needed to take raw footage and create a final video. Instead of taking your footage, uploading it, editing it, and then downloading it, QuickShot simply creates a video for you using your best shots. Whether you’re a beginner or pro, you’re going to love the next-gen F200 Shadow HEX–Force1’s most advanced GPS drone. The new Follow-Me and Point-of-Interest modes make it a snap to record your every move or precise locations on your phone’s GPS map. And, that’s just the beginning. This drone offers Wi-Fi FPV with your iPhone or Android device so you can see what the Shadow HEX drone sees in crisp drone 1080p. Mount your device directly to the quadcopter drone controller remote. We recommend this remote control drone with camera for adults and beginner FPV racing pilots who need something to practice on. The drone will race home on auto from up to 500 meters, and fly routes on your phone’s GPS map. The F100GP Ghost is an amazing value for the price. The F100GP rc quadcopter is both tough and nimble, and comes with a GoPro compatible camera mount, which means you could get professional quality shots. If you don’t want to purchase a GoPro seperately, the F100GP comes with a detachable 1080p drone HD action cam to capture crisp drone imagery. The brushless motors on the F100GP not only make for a smoother, quieter flight, but allow for precise control while flying and longer flight times—at 15 minutes, this drone has one of the longest battery lives of drones on the market for this price point. The F100GP is also a good beginner/intermediate drone for still photography and aerial videography. It comes with High/Low Speed modes, which allow for greater control when it comes to getting the perfect shot. 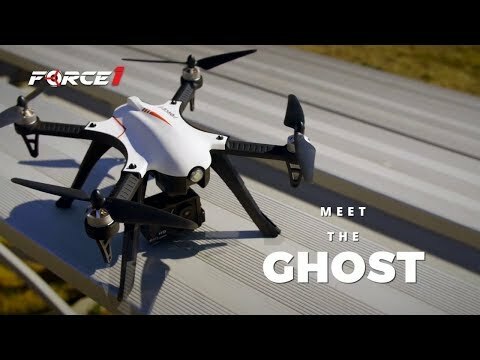 If you decide to buy the F100GP, make sure to register your drone with Force1 to get your free extra battery (value of $25). Flying a drone may be ridiculously fun, but it’s not as easy as it looks. I often suggest to newer pilots looking to gain confidence in foundational multirotor proficiency to log practice hours on a less expensive sUAS before buying a professional / more advanced model. Enter the UDI U818A, one of my favorite aerial photography and videography training quadcopters. The UDI U818A boasts altitude-hold and a first-person-view (FPV) screen, so you can see exactly what the HD camera of your drone sees…in real time. Great practice for those of you looking to get into FPV racing, or interested in exploring different aerial photography techniques. If you’re looking for an affordable (yet surprisingly durable) model, the UDI 818A is one of my favorite training drones with a camera. It’s a great gift for the hobbyist drone pilot looking to take some 2MP pictures from the sky, or the budding commercial drone operator who’s looking to master multirotor proficiency on a more forgiving system. While the above list represents the most popular camera drones at this given time, when it comes to drones with a camera, there are a LOT of choices you have. Hopefully after reading this article you have found one that fits your goals, skill set, and budget. Blue skies and safe flying out there! Do you have any questions? Email us at support@uavcoach.com. This drone comes with an HD camera for 720p high def aerial photos and videos with 2MP. It’s great for beginners, in part because you can fly it right out of the box without needing to adjust the drone’s position or orientation prior to flying. Another feature to note for the U45W is one-key takeoff and landing, which allows you to launch and land the drone with 1 button. You can fly custom routes with this camera drone on your phone, and see what your drone sees on your mobile device with first-person view (FPV). It also has an “Altitude Hold” function, which makes it super easy for beginners to fly, since this allows for stability in the air, and comes in handy when you’re trying to get just the right photograph.